I have a problem with my homemade buck converter. It is based on a TL494 control chip with my discrete MOSFET driver. The problem is that my inductor squeaks and whines, when the output current exceeds a certain value. As an inductor, I have first used a common toroidal choke from an old ATX PSU (yellow color with one white face). However I noticed it was really getting hot, and that was not the loss in my copper wire, it was the core not being suited for switching application, but rather for filtering purposes. Then I disassembled a small ferrite transformer, wound my own inductor on it but it was squeaking again. Then I thought that it might be due to the cores not being ideally glued together, so then I decided to do this on a larger transformer (probably EPCOS E 30/15/7 with round center part, but unfortunately I have no idea about the material used in this core and if it is gapped or not), but this time with carefully removed windings without taking the core apart. The result was acceptable (my signal generator didn’t arrive yet, so I cannot precisely measure the inductance, but it is in the region of 10uH, 6 turns (of a couple wires to reduce the skin effect)). It is still squeaking, but only at voltages and currents that probably will not be reached with my LED lighting (basically I want to create my own DC-DC converter to control the voltage applied to LEDs instead of using PWM, which created too much EMI). 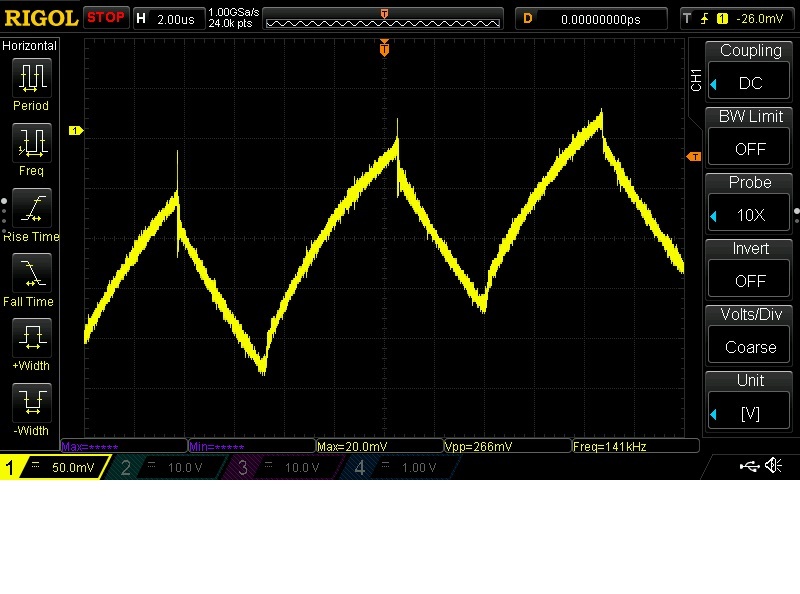 Here are the waveforms (current flowing through inductor, measured voltage drop across a 0.082 Ω resistor ~0.1 Ω), that I captured back when I was using iron powder core (yellow-white) as inductor core. 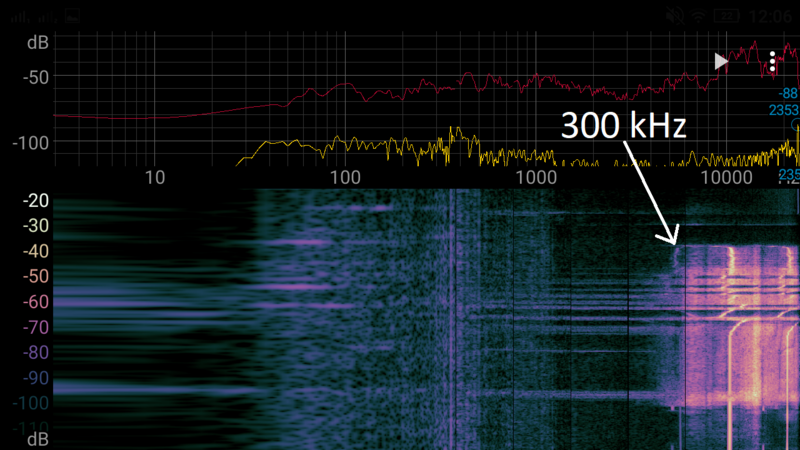 Every waveform is DC-coupled. High output current: ca. 3A. At this level the squeaking starts. But I have to emphasize out that the inductor core was heated to ca. 90°C. 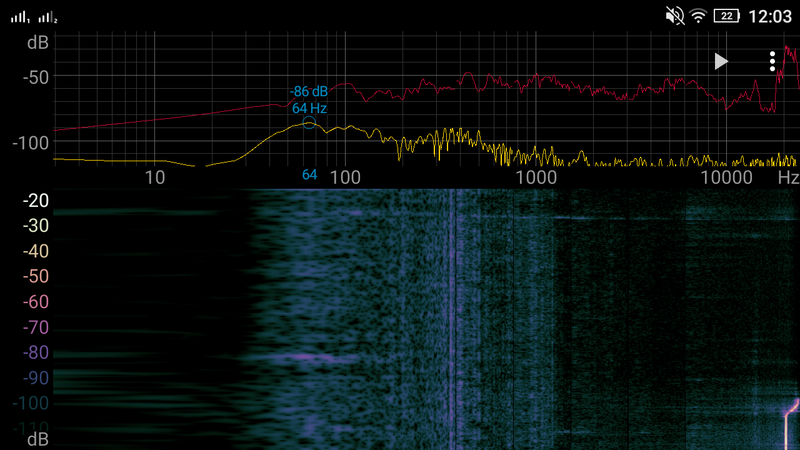 This basically looked like a waveform from above, but modulated by a low frequency sine wave. 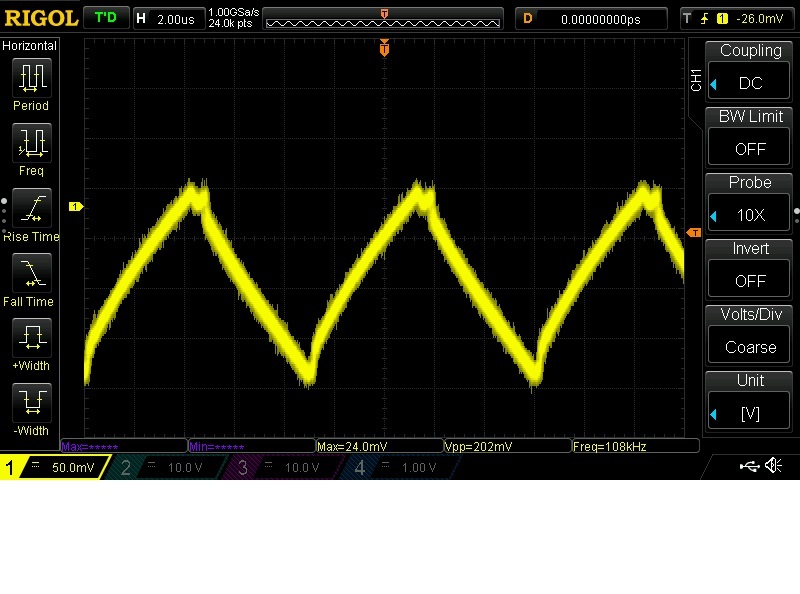 Here are the waveforms that I got with my current ferrite transformer-inductor at the moment when squeaking starts. Channel 2 (blue): voltage across inductor. At this point squeaking appears. I tried increasing and decreasing output capacitor, but it generally didn’t solve the issue. Also, the ringing gets dampened, when I touch the non-isolated MOSFET heatsink, I have no idea why this ringing even exists. D4, C2, R15 were finally replaced by a better and more robust solution, but it doesn’t make an influence on the waveforms on inductor L1. 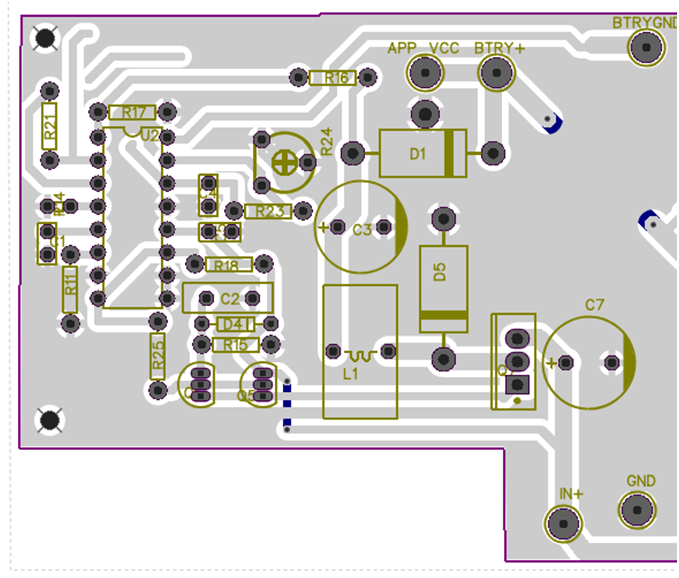 This is my PCB layout, it was designed for a different application (requiring 0.5A – 1A max, so I didn’t add any heatsink there). Also, the values of some resistors and capacitors were manually adjusted to make up nice efficiency of ~86% at full load, the bulk of power that is wasted happens in MOSFET Q7, probably because of slow rising and falling edge of gate signal and Rds(on), being at 0.3 Ω. After that I lowered the inductance by unwinding 1 turn and it started to squeak at much lower currents. The same happens when I add more windings. When I change the frequency, nothing interesting happens. I have also calculated the capacitor and inductor values using the formulas provided inside TL494 datasheet, but it was squeaking with those as well. Every current measurement was done on the output side of the inductor. I've measured the ESR of my output capacitor and the LCR-T4 tester showed 0.09 Ω. To summarize: I have a problem with whining/squeaking inductor and I don’t know how to fix it. At every level my LED lights draw less current, which is required to make the inductor squeak, but my heart really wants to know why is this happening and what I don’t understand or understand wrong. Please help me. If I missed any details, I will write them in a comment to this question. Sorry for any mistakes in my “Engrish”, it’s not my native language. I am not experienced in this field, so please, forgive me if I made some big mistakes. The solution to solving this problem is adding a negative feedback, as explained in this video https://youtu.be/wNnOfF1NkxI?t=1584. Firstly I added a capacitor between the output and feedback pin of the TL494, it seems to have solved the issue, but it doesn't work as good as adding a proper negative feedback. I have done some tests, that prove this: At first, I increase the current from 0A to 3A and then I change the oscillator frequency from ~170 kHz to ~20 kHz and then go up to the "crash" (I suppose) of TL494 ⇒ beyond 300 kHz and then return to ~170 kHz. 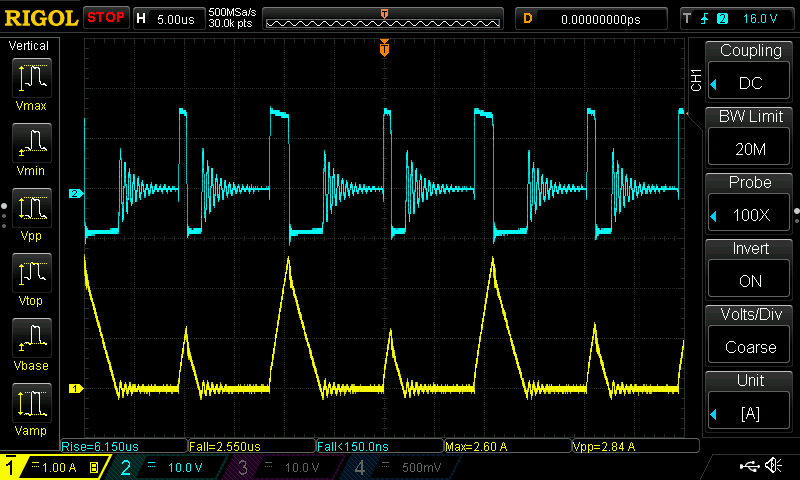 Yellow trace - voltage at oscillator capacitor, Blue trace - current flowing through inductor. The inductor now is not whining but hissing, it depends on the core used, because when I tried with EI, it was less noticeable (during the night the tape has loosened and the inductor started squeaking, now I am experimenting with nail polish as a way to glue the core and still be able to take it apart), This test was done with a factory glued EE core. 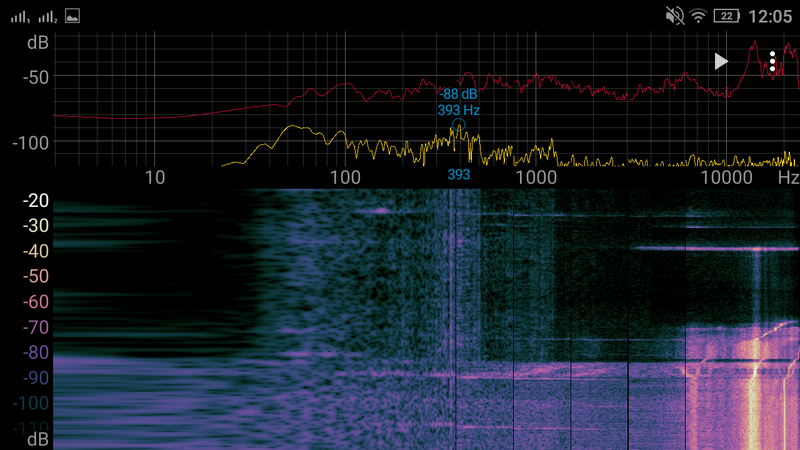 The screenshot of a "spectroid" app is done when the output current is at 3A and at the bottom You can see the 20 kHz moment and at the top 300 kHz. Later I will check if my push-pull MOSFET driver works fine now. If there is a need, I can do a more advanced recording and show the frequency generated by the inductor corresponding to the oscillator frequency. Although the 594 has a much higher GBW and tighter 5V tolerance than the 494 they still have a reference design that uses 20 kHz as opposed to 100 kHz for the switching speed. It also allows a lower C value for f control. All else seems to be identical so you can make the 494 work better with some changes. Your design appears to have weird deadtimes perhaps from weak push-pull current or dead-time Voltage. Your push-pull driver design it has a combination of f/2 (sub-harmonic) of f with weak base current causing some instability. Therefore I would suggest that you reduce the base resistors down to 330 Ohms instead of 10 K and use 20kHz single ended to Rc =10x Rb to drive the FET with a voltage divider or Zener if necessary to limit Vgs to 20V. This combination allows 1% deadtime and tighter regulation from 0% PWM to 99%. But check the deadtime setting. Magnetic components can produce audible noise, since they contain many physically movable elements, such as coils, isolation tapes and bobbins. The current in the coils produces electromagnetic fields which generate repulsive and /or attractive forces between the coils. This can produce a mechanical vibration in the coils, ferrite cores or isolation tapes, and human’s ears just can hear the noise, when the switching frequency of power supply is in the range of 20Hz to 20 KHz. minimize L resistance , DCR which causes a step rise before current ramp and effective adds ripple thus noise to the control loop. 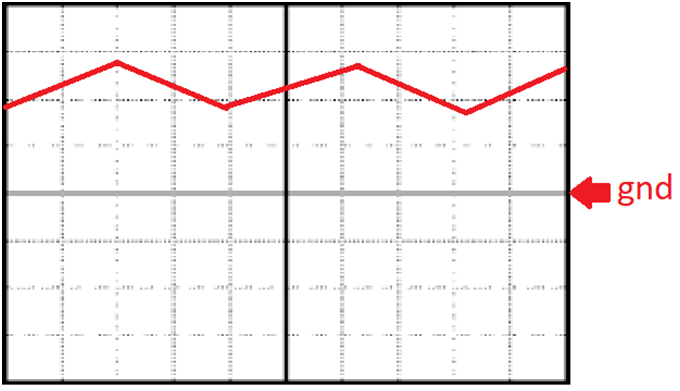 Compute L/R ratio and compare with C*ESR time constant for low ESR cap and thus reduce reactor time constants. The ferrite has magnetic domains which cause hysteresis when the current reverse direction. Exciting these with current then to return 0 A stimulates some Vibration, but why? 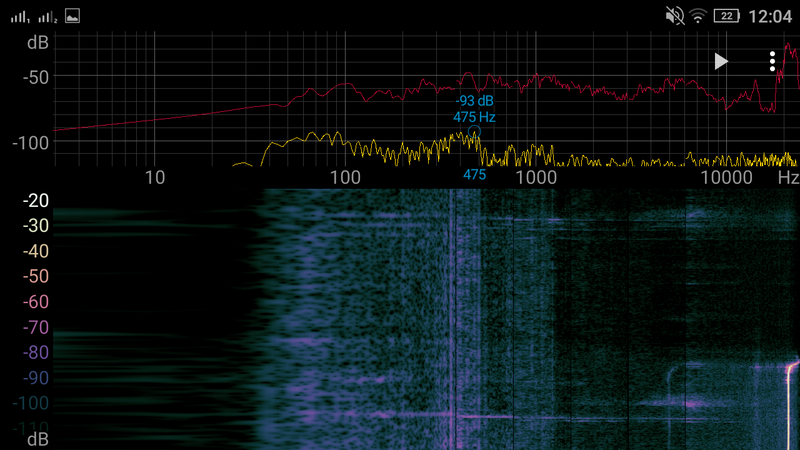 If the subharmonic f/2 is unstable resulting modulated pulse width and mixes with the main 100kHz f used in the bottom cycle rate, there may be a wild superhet audio squeal of 100k - 50k producing this sound 0 to 50kHz. changes to the Feedback filter is lead-lag filter may improve this. When current stops in the Inductor we say it is operating in the DisContinuous Mode (DCM) and the Switch must be open at this time and little current load is applied. The switch present a small capacitance in series with L which creates a high impedance parallel // resonance of 6MHz on your last curve decaying in < 10us. This gets dampened by skin resistance and lower frequency by skin+body capacitance. (?100k//200pF?? )when the heatsink is touched but is not the issue for noise. This is the current schematic diagram for my MOSFET driver: imgur.com/VWLBdt3 . On the old one I had voltage drops (I couldn't find the source, above certain current the voltage magically dropped, even when I used a LM317 regulator instead of a zener diode) this one fixed the issue. It turns out, I didn't have any dead-time added, because of the resistor pulling that pin to ground. Now, that I added a potentiometer to regulate the voltage from 0V to 5V, I was able to fine tune the dead-time on a specific output voltage and current, it removed the whining completely BUT when I lowered the voltage, the hissing returned, I increased the dead-time, OK, but then I wasn't able to go back to the higher voltage because of the decreased on-time. Another issue is that I can choose the desired voltage and then increase the current; When I do it the other way, hissing returns. 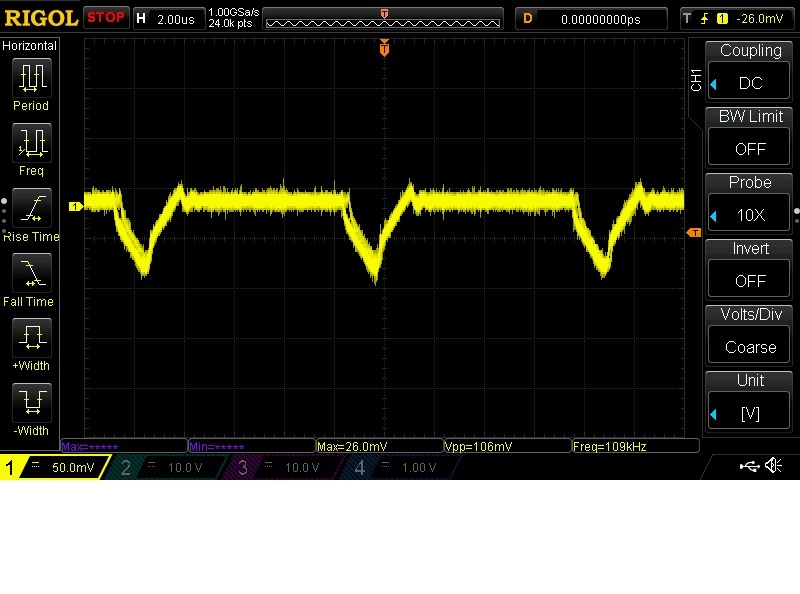 Hissing is often Cap ESR is too high thus Inductor ripple Current gets too high. I added a film capacitor in series (i checked its ESR with my LCR-T4 tester and it showed 0.00 Ω), but it didn't do anything. I tried again with a iron powder core, but this time in CCM, but it's the same story as before: with certain output power it works, but with another it squeaks. Ultimately I returned to my last "working" state being ferrite transformer, 6 turns of wire, DCM. It kind of works, but not as I would like it to work. I will definitely return to this issue in the future, but now I have no idea, what I could do differently (besides using second comparator as current limiter). Your push pull is no good here. I think, I've finally found the solution: I added a 4 nF capacitor in this place: imgur.com/nBEd18F, and it seems to be working fine, the transformation from DCM to CCM finally goes without squeaking. It's still not perfect, I will try to change the inductor from 60uH (on 320uH it doesn't work) to something different, I will go back to my Excel sheet to recalculate the value and see what happens. If somehow Your answer said this (I don't understand everything), then please confirm this. I will do some additional tests and post the results. I didn't see the second update, when I posted my answer, I'm still new to this service. I have trouble understanding, what you meant, buy I will try my best to test this idea as well. [SOLVED] Ferrite vs. iron powder toroid for buck converters? [SOLVED] Can I measure inductor current by adding a secondary winding?